This is something that, once you have set it up and running effectively there is simply no looking back. The diagram below tries to explain the standard set up. The landing pages are the same for all channels. This has a lot of negative impacts for conversion. Often, SEO pages are packed with content in order to please the search engines and gain better positions. The user is sometimes lost within the content and it is not clear how to purchase or proceed to the next stage. Subsequently, conversion rates suffer. 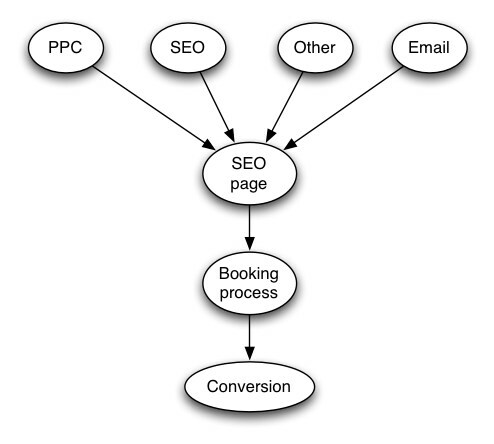 So how do you keep the SEO content needed to gain SEO positions and not reduce conversion on the other channels. Quite simply, have a separate landing page for the different channels. 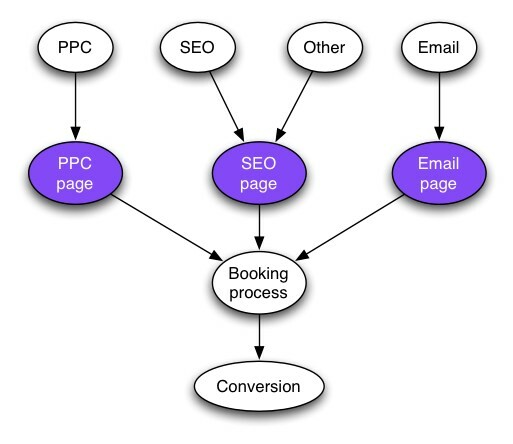 There is no need to have so much content on the page when using PPC or email. Instead, you can set the pages up to convert better. If required these pages can have a no follow so that there is no impact on your SEO strategy, and no duplicate content issues. This is a really simple look at a page set up. In another blog I will talk in more detail about landing page strategies and some of the key requirements to increase conversion. They really are, but it is something worth getting right as the money you can save on click costs is vast.